Jehan and @scottwxrks have rounded out our website update over the past couple of weeks. 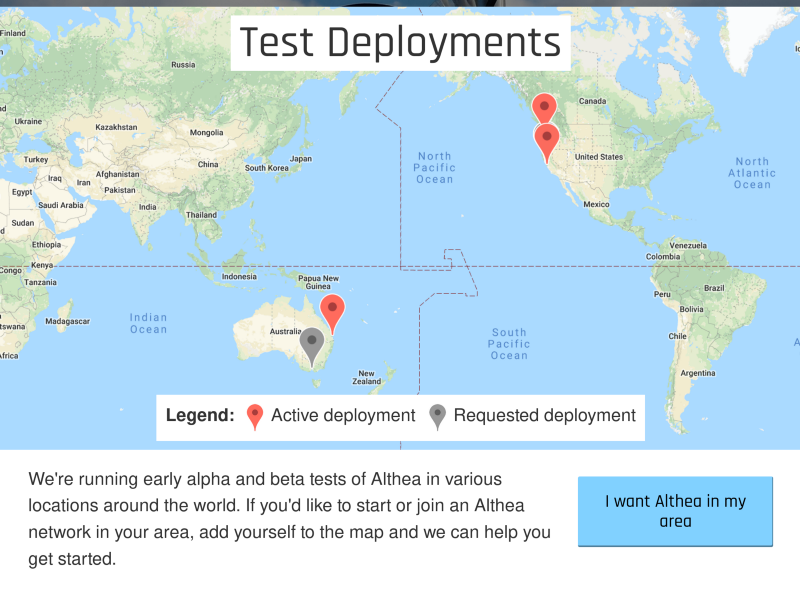 We now have a map showing active Althea deployments and interested users. The goal is to help bring together people who may be interested in using Althea in an area as well as show our expansion as we get some of these locations actually online. There’s a margin of error to prevent revealing home address of course, we only take city and zip. It’s probably a little premature considering snow and the need for a taller pole has delayed the first few users in Clatskanie and I shipped routers to the other two deployments just today. But I’ll consider deployments with gear on roofs to be ‘active’ for now. In our last update we shipped our first devices, I had been growing concerned with our dependence on these WD n600’s and n750’s especially as we began to realize some of their performance limitations. Using Babel’s excellent in kernel forwarding design even the bargain bin n600 can hit line rate and mesh at 100mbps on several ports. But the encryption overhead for the Wireguard tunnel is non trivial and peters out at about 30mbps. Exactly why is a bit of a performance mystery, there’s about 50% free CPU time but no tuning I can find seems to improve it. Not bad for $16, but there’s untapped potential there. What this means right now for Clatskine users is that they can resell to two other homes before they even cut into their own bandwidth. In the search for better hardware the firmware builder now has support for the GL-AR750, Edgerouter X, and UniFi Lite. The AR750 was disappointing, for $25 it mirrors the performance of the n600’s since they share a chipset. The Edgerouter on the other hand makes a great Althea device, with gigabit speeds on the mesh and about 600mbps over Wireguard. The Lite is somewhat harder to test conclusively with the involvement of WiFi but breaches 200mbps over WireGuard easily enough for me to be unconcerned. While the Edgerouter is great for network backbone tasks it’s lack of WiFI eliminate it from the running as an ideal home device. The UniFi lite has the opposite issue, great wifi, but with only one Ethernet port it won’t satisfy power users or have a ‘plug and play’ resale capability. The quest for a under $100 device with no performance compromises continues. On the software side the billing daemon is coming along nicely. I’ve been working on integrating some more bootstrapping support into it as we try and bridge the gap between the development and testing environment and our real operating platform on the routers. WireGuard is once again a major focus of concentration here, by design WireGuard requires out of band key exchange and ip address assignment, in exchange for this you get great speed, simplicity, and other security properties but it’s something of a pain right now to setup a new device. Currently a device is flashed with a blank firmware and is then customized by running a shell scrip at first boot. This shell script then drops the required credentials to be sent to the WireGuard server (currently via copy and paste), while this works it complicates the flashing process. Making the flashing process simpler is a long term project with the eventual goal of a push button ‘install Althea’ application. While maybe still not end user accessible it would be great if the people setting up Althea on the ground could easily flash devices from the box instead of us having to ship them around.